I had a client send me an article of the 1st public reference of the word “dandy” and the writer claimed it was about Theodore Roosevelt. You can see by this photo why the guide who was hired to take him on the Bison hunt in Dakota Territory called him a “dandy” and why he had second thoughts about the whole thing when this man got off the train. The high voiced spectacled man insisted he wanted to hunt on horseback and the guide informed him that no “greenhorn” from the east was going to use any of his horses – Roosevelt would ride in a buckboard. It was only after Roosevelt offered to pay $50 for one of the man’s horses that he was able to get what he wanted – and show the man he could actually ride. 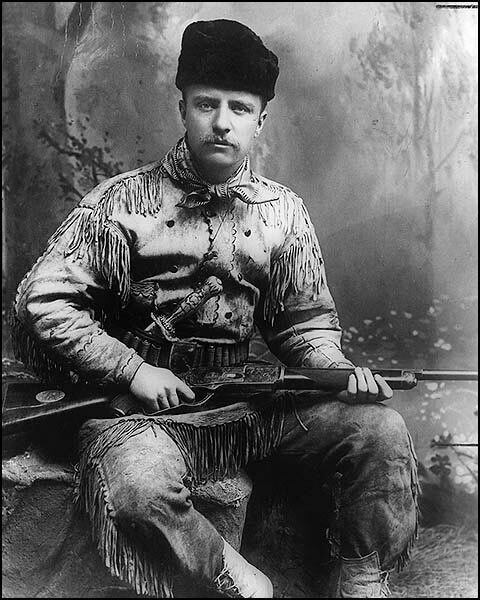 Roosevelt first went to the badlands to hunt that bison and he had his clothing, knife and gun made to his specifications. Of course, he had the local photographer take his photo in studio to show the amazing outfit he had assembled – The buckskin shirt you see on him here was made for him for the outlandish price of $100 – a steep amount indeed (when you consider he offered to buy a horse for $50). But when you add the silver and gold gun with ivory handles and the knife you see tucked in his buck skin pants, his investment just to look good for his bison hunt is impressive. His bowie knife was made by his friends at Tiffany’s – who would supply him for much of his life. In fact, it was Tiffany who funded special rifles for the Rough Riders at Roosevelt’s request. I was fortunate to come upon a reproduction of his knife which I take in a glass case to many of the events at which I speak. The side you see here pictures Davy Crocket, on the flip side is his name spelled out in cursive. The blade on the Davy side features bears, while the opposite has a scenic deer motif. The knife is silver and heavy and larger than life, just like its owner was! Only the best for “Teddy”. Was it the silver 1884 Tiffany Knife? We’ll never know! Dig deeper than the PBS series could. “Speak softly and carry a big stick” was a preventative approach to war, not the reason for one. Roosevelt knew that having a strong military and showing the world that the United States was prepared to take action if attacked, meant that the potential enemies would think twice before doing so. They did – The United States was not involved in any major conflicts during Roosevelt’s Presidency. 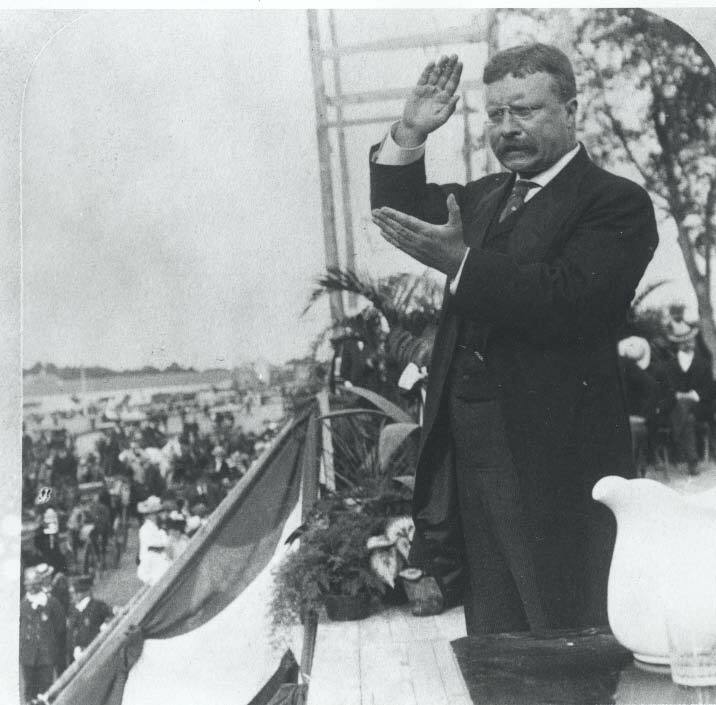 (We did support Panama in their quest for independence, but the U.S. was not directly named in the conflict) Additionally, Roosevelt was the first American to win the Nobel Peace Prize for his work with brokering peace in the Russo- Japanese War. That’s not very “war mongering” – it actually is the exact opposite. As a leader in the battle of San Juan Heights, TR lost friends and many of his men, so he knew the direct cost of war. His position was peace, with an understanding that he would defend his countrymen if we were placed in a position to do so.